I originally posted the following article four years ago, here, and with the current discussion of Planned Parenthood and the renewed cultural debate on abortion this is a particularly relevant post to revisit. What follows is an unedited reposting of my 2011 article followed by a brief addendum to clarify the original conclusion. 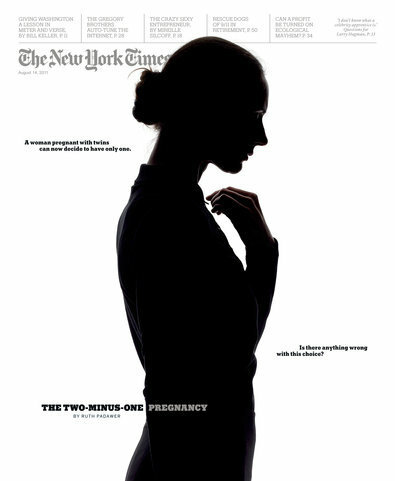 This Sunday’s cover story, “The Two-Minus-One Pregnancy”, for The New York Times Magazine is nothing new. I wrote several years ago, in “When the Fertility Clinic Meets the Abortion Clinic: A Modern Paradox,” about a similar article in the Los Angeles Times. In fact the only thing that has changed in these four years are the numbers. The reasons and the response are the same things that have been around since the first abortion and if we were to go back further to the origins of infanticide. When reading these articles, or the responses to them, they are so predictable that they almost appear to be scripted. With that I hope to take a departure from the typical response and argue that the real issue here is not life, it is not choice, and it is not even murder. The real issue is sovereignty. What seems increasingly clear to me is that, in the absence of an objective definition, a foetus is a life by any subjective measure. My daughter was formed at conception, and all the barely understood alchemy that turned the happy accident of that particular sperm meeting that particular egg into my darling, personality-packed toddler took place at that moment. She is so unmistakably herself, her own person — forged in my womb, not by my mothering. She then explains that such conclusions have resulted in a movement aimed at separating feminism from “fertility control.” However, she views this as entirely incompatible with the central aim of feminism exclaiming, “The single biggest factor in women’s liberation was our newly found ability to impose our will on our biology.” The freedom of women then depends upon one thing the unencumbered exercise of the will. As ever, when an issue we thought was black and white becomes more nuanced, the answer lies in choosing the lesser evil. The nearly 200,000 aborted babies in the UK each year are the lesser evil, no matter how you define life, or death, for that matter. If you are willing to die for a cause, you must be prepared to kill for it, too. For Antonia Senior, and I would argue for all of us, the principal issue is sovereignty, a woman’s ultimate right to impose her will upon herself and upon others. Sovereignty occurs vertically in the form of worship, we could use other words but the concept remains the same. We either rejoice in the sovereignty of the God in whose image we are made or we deny it by worshipping any number of god’s made in our image. Horizontally human interaction exists upon a continuum of two extremes; escape and conflict. Both extremes end in death and both are false exercises of sovereignty. At the extreme end of escape is suicide where the sovereign self claims sovereignty over the self by taking one’s life. At the extreme end of conflict lies murder where the sovereign self claims sovereignty over another by taking another’s life. After all this talk of a woman’s complete control of her own fertility comes the tragic conclusion that “there’s only so much we can control.” Ultimately you cannot impose your will upon your biology because ultimately you are not sovereign. Your sovereignty is an illusion. How are we to respond to this? Should we call our senator or state representative? Should we start building picket signs and begin protesting abortion clinics? No, we must respond with the Gospel, in word and deed. We must respond in the same way that God responds to humanity’s first act of false sovereignty in the garden, with grace and the promise that in Christ we will be liberated not unto self but from self and sin and set free to worship the one true Sovereign. Any other response is incalculably inadequate and nearsighted. The church is a global reality and when I address issues, such as this one, my primary concern is how the global church should respond. And our primary response and concern must be proclaiming and incarnating the Gospel (Ephesians 6:10-20). After all abortions do not occur simply because they are legal or because of Planned Parenthood. No, they occur because of our insatiable desire for control, for sovereignty; they occur because humans, both as individuals and as humanity, a global culture, are unflinchingly committed to our rebellion against the true Sovereign. That must be our first and primary response. Any other primary response is, as I said four years ago, incalculably inadequate and nearsighted. Now, I still have little patience for evangelical political activism. As Ed Stetzer lamented in Breaking the Missional Code, ” For many, evangelicals have become a voting block rather than a spiritual force” (2006:9). Political activism alone, defunding Planned Parenthood for example, would only be as beneficial as God bringing the Jews out of Egypt without also bringing them to Himself. But in 2011 I was unbalanced and failed to recognize the uniqueness of the American situation. The global church must respond with the Gospel, as in many places political change is not possible in the same way that it is in the United States. The church mush make the gospel our primary concern, we must make the truth known, we must seek to see men and women reconciled to the God whose image their born and unborn children bear. At the same time when there is opportunity seek political change we must do so humbly, with a knowledge that political change is important but not ultimate. God is redeeming the whole of creation from the cancerous cells growing in your body and the raging of the seas to the political and cultural structures of man. He is, and ultimately will, set those things right, their rebellion will be brought to an end, and the earth will be renewed and inhabited by the new humanity. But the renewal of creation is inextricably tied to the reconciliation of God and man (Romans 8:18ff.). So feel free to contact the political powers that be and seek to persuade those who make those decisions but do so knowing that what your neighbor who is considering an abortion needs most is not legislation but reconciliation. I hope this was a beneficial read and I hope that this addendum has clarified what was lacking in my previous conclusion. This is the second post in a series critiquing Gary Millar’s “A Biblical Theology of Mission: An Evaluation of Chris Wright” delivered at the 2013 Gospel Coalition National Conference. This post will take one or more of Millar’s main sections, as outlined here, and further develop his content as well as offering critique when necessary. What follows are Millar’s concluding remarks, which come as a rapid fire summary, and because of what they are this last post will take the form of bullet points of his concluding synopsis with limited critique or development. There are, however, a few points which necessitate an extended rebuttal. Mission is the mission of God. Mission is central to the whole Bible as God is central to the whole Bible. The Bible is written on mission, it is the product of God’s people on this journey to perform his mission. We need to read Bible through a missional lens, a missional hermeneutic. If all the Bible is about mission, then we need to allow the whole Bible to shape our mission, not just the great commission. He argues that sin is all-pervasive, between individuals, between generations, in countries. The paradigms for mission are the Exodus and the Jubilee. Therefore, God’s mission is all-embracing, setting all nations and all peoples free from the all-encompassing sin that we encounter. I hope I have represented him fairly. It is a very sweeping vision, or re-visioning of the idea of the mission of God. That’s what he argues, ok. Now, if you’ve never read The Mission of God that’s as clear as I can make it. It is not the clearest book that has ever been written. This is similar to Millar’s sarcasm in dealing with his inability to understand Wright’s missional hermeneutic, I addressed this in the third post. Again these remarks cast doubt upon the spirit of Millar’s critique and this is especially the case as he gives no evidence or examples of what makes this volume so incomprehensible. Is it the volumes length? The structure of Wright’s argument? His emphasis of the whole Bible and not just the New Testament? Quite to the contrary this reviewer finds Wright’s volume quite easy to grasp and this is due both to the effort he has taken to outline his thoughts, the book begins with a table of contents and then an eight page outline of the books major points and supporting points, as well as the way Wright goes about explaining and illustrating his entire argument. The God-centeredness of the approach. Millar says that the God-centeredness of Wright’s approach is marvelous. This is The Story that tell us where we have come from, how we got to be here, who we are, why the world is in the mess it is, how it can be (and has been) changed, and where we are ultimately going. And the whole story is predicated upon the reality of this God and the mission of this God. He is the originator of the story, the teller of the story, the prime actor in the story, the planner and guide of the story’s plot, the meaning of the story and its ultimate completion. He is its beginning, end and center. It is the story of the mission of God, of this God and no other (533). Chris is certainly correct to say that all mission is God’s mission, rather than what we do even in the response of God’s command. And in that I think the book is a game changer that helpfully corrects an error that we can easily slip into and we need to thank God for that. His insights into key Old Testament texts. He clearly articulates what God asks of us. At points he affirms that evangelism is at the heart of mission. This is really an underhanded compliment. Millar goes on to read and ultimately dismiss several quotes and while he is thankful that Wright made these statements he questions whether this is actually the case. Jesus sums up the whole message and point of the Old Testament as leading to himself, the Messiah, and to the mission of his disciples to the world (Lk 24:44-49). And that mission, in the light of his death and resurrection, was the evangelistic task of preaching repentance and forgiveness in Christ’s name to all nations. All this is readily granted and is at the very heart of the whole case I am making in this book (303). Mission may not always begin with evangelism. But mission that does not ultimately include declaring the Word and the name of Christ, the call to repentance, and faith, and obedience has not completed its task. It is defective mission, not holistic mission (319). To think that social action is all there is to mission, while failing to lead people to the knowledge, worship and service of God in Christ, is to condemn those whom we may, in one way or another, “lead out of slavery” to repeat the history of Israel. For the Israelites experienced the political, social and economic effects of God’s redemption, but many of them failed to enter into the spiritual requirements of the God who redeemed them. They would not acknowledge him as alone God. They repeatedly went astray in the worship of other gods. . . Without covenant faith, covenant worship and covenant obedience, Israel stood as much under the severity of God’s wrath as any other nation (286-287). Wright has clearly outlined, using the history of Israel as an example, that social action, even when undertaken by God, will leave men condemned if they are not lead into ” the knowledge, worship and service of God in Christ” this does not match Millar’s description of an author who is belittling the importance of evangelism. “I was not ultimately convinced by his use of the term a missional hermeneutic. Nor am I still entirely clear what a missional hermeneutic is. I am not sure if it means any more than reading the Bible with an awareness that mission is important.” Millar’s criticism of Wright’s use of “missional hermeneutic” was addressed at some length in Part Two please reference that post for a rebuttal of Millar’s argument. Millar says more to emphasize his point here but again he offers more dismissive commentary which need not be handled here as his tone has been addressed at several points in this series. One of the unfortunate characteristics of this book is that it elevates relatively minor themes at times to a status that the text itself doesn’t appear to warrant. So for example Chris does speak as if the missional nature of Israel is absolutely everywhere in the Old Testament. First, “This universality of God’s purpose . . . is a recurrent theme and a constant theological challenge” (65). This first example is a rather peculiar choice. It comes in the context of the call of Abraham in Genesis 12. It is hard to imagine that any biblical scholar would consider the call of Abraham and God’s purpose in it a minor theme and yet this is exactly what Millar does at this point. In the immediate context of this quote Wright explains, “Israel’s election [in the call of Abraham and subsequent covenant] was not a rejection of other nation but was explicitly for the sake of all nations” (65). Millar’s claim that this is a minor theme elevated beyond the status of the text is completely untenable. Second, “The exiles had a task, a mission no less, even in the midst of the city of their enemies” (99). This too is an interesting example. This statement comes near the end of a section where Wright explains the echoes of the Abrahamic Covenant in Jeremiah’s letter to the exiles (Jeremiah 29). Contrary to their fears that they would die out in exile Jeremiah echoes the Abrahamic Covenant as he exhorts them to “multiply there, and do not decrease” (Jeremiah 29:6). Jeremiah then writes, “And Seek the shalom of the city to which I have exiled you, and pray on its behalf to YHWH, for in its shalom there will be shalom for you” (Jeremiah 29:7, Christopher J. H. Wright’s translation). Wright then correctly concludes; “So they were not only the beneficiaries of God’s promise to Abraham (in that they would not die out but increase), they were also to be the agents of God’s promise to Abraham that through his descendants the nations would be blessed” (100). As with the first example attempting to argue that the Abrahamic Covenant and its application to the exile is a minor theme is simply not a defensible position and yet this is precisely what Millar is claiming. by confining ourselves to the human dimension: it is crucial to emphasize the point that knowing God to be God is the supreme good and blessing for human beings made in God’s image. Refusing or suppressing that knowledge lies at the root of all other kinds of sin, argues Paul in Romans 1:18-32. Conversely, knowing God in love and obedience is the source of all human well-being and good (Deut 4:39-40) (128). This is the chief end of man, of the nations, and indeed the entire creation is eagerly anticipating the redemption of humanity. Keep them [the law] and do them, for that will be your wisdom and your understanding in the sight of the peoples, who, when they hear all these statutes, will say, “Surely this great nation is a wise and understanding people.” For what great nation is there that has a god so near to it as the Lord our God is to us, whenever we call upon him? And what great nation is there, that has statutes and rules so righteous as all this law that I set before you today? There is a sense in which Wright may have worded his statement too strongly after all the text of Deuteronomy lists numerous reasons as to why Israel should live by God’s law but as evidenced in Moses’ opening address the nations are clearly in view as the law is given. For a further treatment of the law please see this. When they [the nations] are not in the foreground, they are there in the background. When they are not the subject of great international events, they are the object of divine inspection or accusation. When they are not the direct focus of God’s attention, they remain the surrounding context (for good or ill) of the life of God’s people. The obvious reason for all this is that the Bible is, of course, preoccupied with the relationship between God and humanity, and humanity exists in the nations. And where the Bible focuses especially on the people of God, that people necessarily lives in history in the midst of the nations (454). Sixth, “It is God’s mission to the nations more than any other single theme that provides the key that unlocks the biblical grand narrative” (455). There are countless biblical theologians who offer some kind of unifying theme for the whole of Scripture. To a massive list including covenant, redemption, the glory of God, and countless others one can now add the nations as a proposed center for biblical theology. In this reviewer’s summation the majority of proposed unifying themes moves beyond the status given in the text. This would have been a helpful point for Millar to provide an adequate alternate unifying theme for biblical theology. With the myriad of proposed themes there is no reason why the nations, and Wright’s supporting arguments, should not be considered as a plausible unifying theme. Now do I have sympathy with every single one of those statements? Yes. Are the overstating the case? Yes. Similarly, the insistence that both the Exodus and the Jubilee have primarily a symbolic function or that the return from exile is one of the major movements of the Old Testament are going further, I think, than the Old Testament text itself claims. Wright’s work in this area is absolutely fantastic as he traces these themes throughout the Old Testament and into the New Testament demonstrating how they are intimately tied to the mission of Jesus and His church. There is much work done here in terms of both biblical references and external references that corroborate his position. It is interesting that Millar confines his critique to the Old Testament’s claims. Jesus’ ministry is filled with references to the Jubilee from his reading of Isaiah in Nazareth and the beatitudes to his teaching on forgiveness and debt. This is mirrored by ample New Testament themes that echo the Exodus and return from exile. I know we’re all shaped by our past but it seems that Chris’ past has left him with a real discomfort for the idea of going anywhere to make disciples. He consistently argues that the Great Commission isn’t as important as we make it out to be and doesn’t really tell us to go anywhere, other than to the nations in some sense like Abraham. He seems oddly preoccupied with Matthew 28 and insists that it be relativized. However, he barely mentions Acts 1 verse 8, with its similar dynamic, driving people out to the furthest parts of the earth with the gospel. In fact the silence is deafening, in this book on the Mission of God, with the whole issue of relocating in the interest of gospel ministry. “It [the Great Commission] is not referred to as an explicit driver for the missionary expansion of the church in the New Testament after Acts 1.” He consistently underplays the Great Commission. There are several things occurring at this point that must be addressed. First, Millar is subtly, yet quite erroneously, using Wright’s upbringing as a theological attack. Second, he is not honestly representing the content of The Mission of God in regards to its stance on Matthew 28, Acts 1, and relocating in the interest of gospel ministry. Finally, he is quoting, sorely out of context, a sentence from another one of Wright’s works. First, Millar’s use of Wright’s past as an attack against this present work is without warrant. Millar has consistently spoken of Christopher J. H. Wright during his talk using his shortened first name Chris. This would lead those in attendance to believe that they are apparently on a first name basis, have some kind of relationship, and therefore Millar is somewhat qualified to make observations in regards to Wright’s childhood, beyond what anyone would know reading the beginning of The Mission of God. This is not the case. As evidenced from the Q&A near the end of the recording Millar did not even have the courtesy to contact Wright and discuss his critiques beforehand. This whole line of critique is therefore quite faulty. Beyond that claiming ” Chris’ past has left him with a real discomfort for the idea of going anywhere to make disciples” is quite inaccurate considering that Wright has relocated for the purpose of gospel ministry and worked to train and equip other missionaries. My major concern has been to develop an approach to biblical hermeneutics that sees the mission of God (and the participation in it of God’s people) as a framework within which we can read the whole Bible. Mission is, in my view, a major key that unlocks the whole grand narrative of the canon of Scripture. To that extent I offer this study not only as a biblical reflection on mission but also, I hope, as an exercise in biblical theology. . . I have tried to identify some of the underlying themes that are woven all through the Bible’s grand narrative—themes that are the foundational pillars of the biblical worldview and therefore also of biblical theology: monotheism, creation, humanity, election, redemption, covenant, ethics, future hope (17). We talk about the problems of “applying the Bible to our lives,” which often means modifying the Bible somewhat adjectivally to fit into the assumed “reality” of the life we live “in the real world.” What would it mean to apply our lives to the Bible instead, assuming the Bible to be the reality—the real story—to which we are called to conform ourselves (534)? Wright is laying out the biblical narrative and then confronting the reader with that reality. That is his intent. The grand universal narrative that stretches from creation to new creation, and accounts for everything in between. This is The Story that tells us where we have come from, how we got to be here, who we are, why the world is in the mess it is, how it can be (and has been) changed, and where we are ultimately going. And the whole story is predicated on the reality of this God and the mission of this God. He is the originator of the story, the teller of the story, the prime actor in the story, the planner and guide of the story’s plot, the meaning of the story and its ultimate completion. He is its beginning, end and center. It is the story of the mission of God, of this God and no other (533). Wright’s primary interest is not in telling the reader to “go” because mission belongs to God, it is His mission and He calls His people to participate in His mission. Wright intends to give the reader a biblical theology of mission and he does just that. He explains “‘the whole counsel of God’—the plan, purpose and mission of God for the whole creation” (532). That narrative is about God and what God is doing to reconcile the whole of creation to Himself “through Christ by the Cross” (532). This has implications for redeemed humanity’s participation in God’s mission but the narrative of Scripture is fundamentally about what God has done, is doing, and will do. This is what Wright explains as being a biblical indicative. This expresses the reality of who God is and what He is doing. This then naturally leads to the biblical imperative “go, therefore and make disciples of all nations.” As Wright himself states, “we need, then, both a missional hermeneutic of the whole bible and its great indicatives as well as committed obedience to a major imperative text like the Great Commission” (60). By explaining the grand narrative of Scripture from creation to new creation Wright is setting forth the great indicative of redemptive history that forms the foundation of our obedience to Scripture’s missional imperatives. This does not underplaying the Great Commission this grounds the Great Commission in the identity and historical mission of our God. Millar seems to entirely miss Wright’s explanation of biblical indicatives and biblical imperatives; that relationship will be further explained in this series’ final post. Millar quotes Wright, “It [the Great Commission] is not referred to as an explicit driver for the missionary expansion of the church in the New Testament after Acts 1” (Christopher J. H. Wright, The Mission of God’s People: A Biblical Theology of the Church’s Mission, 36). and then immediately laments, “He consistently underplays the Great Commission.” The quote comes near the beginning of chapter 2 entitled, “People Who Know The Story They Are Part Of” which sets out to outline the narrative of Creation, Fall, Redemption, and Consummation particularly as it informs the people of God about their mission. Wright then begins to establish a starting point for the chapter explaining, “It’s a natural instinct to start there [the Great Commission] because it chimes in with so much else that the New Testament has to say about Jesus and his followers, and about Paul and the early Christians” (The Mission of God’s People, 35). He then quotes N. T. Wright explaining how mission confronts the reader throughout the gospels and only grows in intensity through Acts and the epistles. But then he makes several important observations first asking, “Why? What was it that made Christianity a missionary faith from the very start? What made the first followers of Jesus so passionately, courageously and unstoppably committed to telling the world about him” (The Mission of God’s People, 35)? Well you might respond, because Jesus told them to. . . And that would be true, given the endings of Matthew, Luke and John . . . though we should remember that the Gospels were not written until well after the church’s mission had been going for many years. . . If this simple obedience to the Great Commission were the major reason in the consciousness of the early Christians, it is surprising that it is never mentioned anywhere else in the New Testament. Don’t misunderstand me here. I am not suggesting for a moment that the Great Commission never happened, only that it is never referred to as an explicit driver for the missionary expansion of the church in the New Testament after Acts 1 (The Mission of God’s People, 36). He then asks the reader a follow-up question, “So what compelled the first followers of Jesus, Jews as they were, to make the world their mission field” (The Mission of God’s People, 36)? With that he moves to answer his inquiry more directly and to establish a starting place for the reader to understand the story of Scripture and the mission of God’s people. ‘Jews as they were’ — I Slipped that in there because it is key to the answer. That is those first believers knew the story they were in. And they knew the story because they knew their scriptures. . . They understood the that the story had just reached a decisive moment in Jesus of Nazareth, and they knew what the rest of the story demanded (The Mission of God’s People, 36). The rest of the story demands missions; the Old Testament narrative demands the active pursuit of fulfilling the Great Commission. Wright then provides three examples of this the Jerusalem Council, the ministry of Paul in Pisidian Antioch, and the emphasis of Jesus’ teaching after the resurrection. One could easily imagine Peter standing up to say to the critics, “Listen, friends, Jesus told us to go and make disciples of all nations and that is what Paul and Barnabas are doing. So back off!” But instead, James settles the matter by reference to the prophetic Scriptures. He quotes from Amos 9 and affirms that what the prophet foresaw is now happening: the house of David is being restored and the Gentile nations are being brought in to bear the name of the Lord. That’s where the story pointed, and that’s what was now happening (The Mission of God’s People, 37). Paul could easily have said, “Jesus commanded us to bring this good news to you Gentiles.” He could even have referred to the specific missional command that he, Paul, had personally received in his conversion-commissioning encounter with the risen Christ on the way to Damascus. But instead, Paul points to the Scriptures and the story they tell—the story that leads inevitably to the gospel going to the nations. And he took that “story-yet-to-come” aspect of the words of the prophet and heard in them a command from the Lord himself (The Mission of God’s People, 37). Finally he addresses the teaching ministry of Jesus and asserts that even Jesus views the Old Testament as the foundation of the Great Commission. Looking towards Luke 24 Wright explains how Jesus commissions his disciples after the resurrection by teaching through the Old Testament narrative. What we find here is certainly not, as Millar claims, Wright consistently downplaying the Great Commission. Rather Wright sets the Great Commission within redemptive history, provides a robust foundation of Old Testament prophecies and promises upon which the Great Commission rests, and points to the tremendous emphasis which Jesus and the Apostles placed upon this Old Testament foundation in regards to: proclaiming the gospel, clarifying issues of praxis, silencing critics, and encouraging the church. This does not downplay the Great Commission it magnifies it! If you read through the book you gradually build the picture of someone who is obsessed with three verses in Matthew, insists that the gospel is only spiritual application, denies that the Old Testament says anything relevant, deliberately attacks little birdies, and refuses to lift a finger to help anyone other than to preach the Gospel. I think that’s a straw man. Perhaps Chris has met many people like that; but I have to be honest and say that I haven’t. In fact I’ve met far more people who would rather do anything in the name of Jesus than talk to people about Jesus. Rather than those who are trying to exclude everything under the sun from the category of mission other than personal evangelism. Millar takes the numerous errors that Wright is attempting to correct, lumps them into one individual, and then declares that this is a straw man. And if this were correct that would indeed be a straw man, but that is not what Wright is doing. Wright is correcting a plethora of different errors advocated by different individuals and groups. If Millar’s critique here were true then every systematic theology in existence would be one big straw man argument, because of the countless heresies and errors they address. As singular errors these are all realities that exist and must be corrected. First, there are those in both the church and the academy whose missiology is based solely upon a few New Testament texts and even those with a more robust New Testament theology of mission might not be capable of elucidating the Old Testament origins of mission. There is a real drought and lack of emphasis in this area and the church should be thankful for works like Wrights’ to function as a helpful correction. Second and third, Millar’s critique of Wright’s claim that many simply spiritualize the gospel and deny its real world application and that others proclaim a spiritualized personal gospel without acts of justice and compassion is an ironic choice in Millar’s case as he has displayed a great deal of discomfort with Wright’s argument for holistic mission. He seems quite uncomfortable with mission that goes beyond evangelism and addresses a host of relational, social, and physical issues as well. Millar has consistently pressed for a spiritualized view focusing solely upon evangelism and now here he apparently changes his position and embraces holistic mission. Fourth, there are several schools of thought that would see discontinuity between the testaments and cancel out much of what the Old Testament says on mission, among many other things, with New Testament teaching. Fifth, the sparrow bit was quite funny and it is doubtful that anyone has “dissed sparrows.” The humor there misses Wright’s point as there are those who will reference passages such as II Peter 3:10 to deny the importance of creation care. Again creation care is a concept that Millar seems to be quite uncomfortable with, especially as he critiques the breadth of Wright’s definition of mission. Perhaps Chris has met many people like that; but I have to be honest and say that I haven’t. In fact I’ve met far more people who would rather do anything in the name of Jesus than talk to people about Jesus. Rather than those who are trying to exclude everything under the sun from the category of mission other than personal evangelism. This may very well be the case but this cannot become a battle of competing extremes. The response to those who would rather do anything than talk to people about Jesus is to correct them. What they are doing is not mission it is incomplete. It is equally incomplete and dysfunctional mission to proclaim the gospel and show no concern for environmental, relational, and social issues. Mission requires both. This covered the first four sections of Millar’s concluding remarks. His final section and concluding summary will be the subject of the next post. Summarizing Millar’s overview. Millar mingles overview with critique so it is helpful to begin by distilling his overview into a positive summary of the four sections contained within Christopher J. h. Wright’s The Mission of God. This is both helpful in understanding Wright’s work and the broader context into which Millar’s critique fits. Part 1: The Bible and Mission – The main argument here is that mission is God’s mission, mission is central to the whole Bible, the bible was written on mission, we need to read the Bible with a missional hermeneutic, and the whole Bible should shape our mission. Part 2: The God of Mission – There are two key locations where Israel comes to know their God, the exodus and the return from exile. He defends monotheism, discusses idolatry, and critiques religious pluralism. Part 3: The People of Mission – Here he argues for the primacy of mission in the election of Israel, this is the controlling idea in the Old Testament. He then demonstrates how the Exodus and the Jubilee encapsulate the heart of God’s missional agenda. Finally, the priesthood of Israel is also presented as a controlling idea in the Old Testament. Part 4: The Arena of Mission – Here he begins to spell out how this affects how we do mission today particularly as it pertains to creation, the image of God, and the nations. Examining Millar’s overview. Now we will work through Millar’s summary, of parts two through four, both to develop his content and offer critique when necessary. Part one was covered in the previous post, available here. Before diving into part three, which Millar describes as generally very helpful, he begins with a few quibbles as he puts it. The first of these is on page 195. Where Wright describes the fall saying, “the soil comes under the curse of God and the earth no longer responds to human touch as it should.” Millar goes on to say that Wright’s explanation, “makes the fall sound like a minor inconvenience for market gardeners than anything else.” He goes on to explain that these quibbles are the exception and explains that Wrights link between the Tower of Babel and the call of Abraham is brilliant. Again this is another misleading and dismissive remark that must cause the review to seriously question the validity of Millar’s critique. If that was indeed all that Wright said about the fall then Millar would be correct in pointing out that this description fails to capture the pervasive and devastating effects of the curse. Within its immediate context it is clear that Millar is painting a less than accurate picture for the hearers of this lecture. The result of this human seizure of moral autonomy is radical fracture in all the relationships established in creation. Human beings hide from God in guilty fear. Men and women can no longer face one another without shame and blame. The soil comes under the curse of God and the earth no longer responds to human tough as it should (195). So indeed Wright has a very comprehensive understanding of the effects of human rebellion upon all of mans relationships. Man is at enmity with his creator, his fellow man, and the creation. This reviewer would have preferred stronger language here, as well as an explanation of man being at enmity with himself, but it is not as inadequate of a description as Millar would have us to believe. It would seem more appropriate to link the exodus to the cross not so much in terms of release from slavery to our own sin (which of course is gloriously also part of this reality) but in terms of release from slavery to all that oppresses human life and well-being and opposes God (278). Wright then, in similar fashion to the Exodus, argues that the Jubilee encapsulates the heart of God’s missional agenda serving as another repeatable paradigm for mission. Furthermore, the priesthood of Israel is also a controlling idea in the Old Testament. Wright does a fantastic job defending all of these points and establishing why the cosmic effects of human rebellion and sin are met with an equally cosmic redemptive mission from God and he does so by addressing the issue biblical theologically. Millar however moves quite quickly through this summary and while offering some critique he does not take time to counter Wrights supporting arguments. Millar finds this to be the most problematic section of the entire work. Here Wright asserts that we need to operate with an understanding of the relationship between God, humanity, and the earth. The Genesis 1:27 mandate to work and serve the earth is ecological and mission to the non-human part of creation is still mission. Millar explains this later in his evaluation but it is important to note here that according to Wright mission must include evangelism and the declaring of God’s Word, a call to repentance, faith, and obedience. If one were to engage in a purely ecological mission then Wright would consider that kind of mission to be incomplete and defective. Again Millar quips that the vast amount of biblical literature covered makes this book difficult to understand and to critique. While he made the assertion earlier that Wright’s arguments were thin and lack clear exegetical support Millar now moves to complain that this section’s abundance of exegetical support make it difficult to grasp. The continued use of such dismissive statements, while failing to dissect Wright’s actual arguments, is not helpful in any sense. If Wright is incorrect please do not dismiss his argument take the time to demonstrate its error. Wright is concerned that we must develop “a radical and comprehensive understanding of sin and evil” (429). Which Wright goes on to explain, “Sin spreads horizontally within society and sin propagates itself vertically between generations. It thus generates contexts and connections that are laden with collective sin. Sin becomes endemic, structural, and embedded in history” (431). Millar concludes that while Wright can express himself beautifully he doubts whether or not there is biblical warrant behind these formulations. Again Millar has reduced Wright’s argument for the sake of a quick dismissal. Wright devotes an entire chapter to the topic of mission and creation and demonstrates the validity of this assertion by describing how Scripture describes sin as spreading horizontally, vertically, and how it “becomes endemic, structural, and embedded in history.” Furthermore, he then counters arguments against this position and provides the example of AIDs to show how “only a holistic missional approach [can] even begin to address the issue” (439). Millar has left the audience with the impression that Wright has not done the exegetical leg work to support his thesis and is relying upon his eloquence to support his point when this is not the case. As at other points Millar is being profoundly reductionistic here as well. Wright divides his section on the nations into two chapters “God and the Nations in Old Testament Vision” and “God and the Nations in New Testament Mission.” Within the chapter on the Old Testament Vision he begins by addressing “The Nations in Creation and Providence” where he begins by working from creation to new creation explaining how the nations and all of their diversity is a glorious reality that will be carried over into worship before the throne of God. After establishing the glorious reality of this diversity and God’s sovereign control over the nations he moves to explain how all nations exist under the judgment of God and the Old Testament reality that any nation can be the agent who carries out God’s justice. This takes several pages rather than the one page that Millar describes in his talk. And from this Wright concludes “the overwhelming message is consistent. All nations are in the hands of YHWH, the living God” (460). “Against such a bleak background, God’s mission to bless the nations and the mission of God’s people as the vehicle of such blessing constitute very good news indeed” (458). This is not a skimming over of judgment but a vivid description of the imminent judgment of God. The rest of the material is positive as he looks toward the fulfillment of the covenant promises as the nations witness the good and bad of Israel’s history, as the nations partake in Israel’s blessing, as the nations worship Israel’s God, and as the nations are included in Israel’s identity. All of this before he begins to look at the nations in the New Testament mission. This reviewer agrees the tone here is positive. But why wouldn’t it be? God is sovereignly bringing about his purposes through judgment and mercy, blessing and curse, God is redeeming a people for Himself and removing the curse from the whole of creation; this is indeed good news. It is a wonder why this disturbs Millar. This concludes Millar’s overview of The Mission of God. His closing summary and remarks will be the subject of the next post. Examining Millar’s overview. Now we will work through Millar’s summary both to develop his content and offer critique when necessary. Part 1: The Bible and Mission – The main argument up to this point is that mission is God’s mission, mission is central to the whole Bible, the bible was written on mission, we need to read the Bible with a missional hermeneutic, and the whole Bible should shape our mission. Millar begins by explaining that the first part of the book is where “he [Wright] justifies his approach and introduces his key terms and conclusions.” Here Wright begins with a brief autobiography, and Millar makes emphasis of their shared Northern Irish origins, explaining what it was like to grow up with the understanding that only proclamation evangelism can be considered mission and that only when done outside of your homeland. From this Millar concludes that this book is reactive not proactive. Which, if you were listening this morning, you will see is rather different than the one that uh that John offered. Chris quickly identifies the mission of God is the driving force behind all that we do. The engine room of the whole book and actually a helpful insight is the quotation we have already seen a couple of times that fundamentally our mission is participation in God’s mission. With that definition of missions in mind Millar dismisses Wright’s definition of mission without any examination or counterarguments. He simply implies that Wright does not define mission the same way Piper does therefore Wright’s definition is to be dismissed and he moves on to define Wright’s key terms. Now, is this actually the case? Does Wright define missions all that differently than Piper does? Beyond that is Piper’s definition so universally accepted and argument so airtight that there is no room for critique? In his book Let The Nations be Glad! The Supremacy of God in Missions John Piper defines missions in strikingly similar terminology to that of Wright. Piper argues with Wright that mission belongs to God and that our mission is participation in God’s mission as demonstrated by the following three quotations from Let the Nations be Glad. Missions flows from the fullness of God’s passion for God, and it aims at the participation of the nations in the very passion that he has for himself (cf. Matt. 25:21, 23; John 15:11; 17:13, 26). The power of the missionary enterprise is to be caught up into God’s fuel and God’s goal. And that means being caught up in worship. God’s goal is that his Son’s name be exalted and honored among all the peoples of the world, for when the Son is honored, the Father is honored (Mark 9:37). When every knee bows at the name of Jesus, it will be ‘to the glory of God the Father’ (Phil. 2:10-11). Therefore, God-centered missions exists for the sake of the name of Jesus. God is pursuing with omnipotent passion a worldwide purpose of gathering joyful worshippers for himself from every tribe and tongue and people and nation. He has an inexhaustible enthusiasm for the supremacy of his name among the nations. Therefore, let us bring our affections into line with his, and, for the sake of his name, let us renounce the quest for worldly comforts and join his global purpose. Millar’s dismissal of Wright’s definition of mission, because it is different from Piper’s, is without basis as both Piper and Wright argue that our mission is participation in God’s mission, in God’s global purpose. The task of evangelism is not the same as missions. Missions is what moved Paul away from the peoples of Asia Minor and Greece (even from those who were still unconverted!) and pressed him toward the unreached peoples of Spain (Rom. 15:24, 28). . . there are not two clearly distinct tasks (domestic evangelism vs. frontier missions) but rather graduations of cultural distance from the Christian community. Where that distance becomes so great that we start calling its penetration “missions” is not always clear. So while Piper maintains a distinction between missions and evangelism, which Wright does not do, he does so admitting that these tasks are not distinct and delineating points of distinction is a difficult if not impossible task. Whereas Wright would not draw a distinction between missions and evangelism Piper draws a distinction while admitting the difficulty of and lack of clarity in doing so. Millar’s dismissal of Wright’s definition is therefore unwarranted. This unwarranted dismissal is quite unfortunate in terms of Millar’s central argument. If Millar truly believes his concluding thought, that this book will result in the end of mission, then he should not be dismissing Wright’s definition so casually. This is a major support structure for Wright’s entire argument in The Mission of God and therefore Millar should be dealing with it accordingly. He should demonstrate why this definition is incorrect, unbiblical, and cannot support the weight of the argument which it serves to support. While this reviewer disagrees with Millar’s fears if there is any merit to them then they necessitate a far more serious examination of Wright’s definition than the one given in this talk. After defining what he means by “mission,” “missionary,” “missional,” “missiology and missiological” the reader is introduced to Wright’s concept of a missional hermeneutic. Millar explains two ways that Wright uses “missional hermeneutic.” First, “that the mission of God is the central idea in biblical theology.” Millar notes that this would simply put Wright’s work in the realm of other biblical theologies which argue for a central unifying theme in the biblical narrative and the reader would simply be tasked with evaluating whether or not this is indeed the case. Secondly, Wright uses this to describe a method of reading the Bible. Millar argues this is confusing as he never adequately explains this. Millar asks “is this then the only way of reading the Bible? Is it one of many ways of reading the Bible? Is this the best way of reading the Bible?” He then argues that Wright has likely set aside the doctrine of Scripture due to much conversation with missiologists who have a lesser view of Scripture than himself. Before addressing Millar’s critique of Wright’s missional hermeneutic, as he has more to say about it, this accusation must be addressed. This accusation is misleading and without support as the discussion of a missional hermeneutic takes place within a larger explanation of biblical authority where Wright urges the reader to move beyond proof texting and recognize the larger authority structure of Scripture. He begins by explaining the importance of the authority of the commands of Scripture, and then moves to explain how reality has an authoritative structure. Within reality we are confronted with the reality of God, the reality of the biblical narrative, and the reality of our identity as the people of God. Finally, he concludes with the authority of Jesus, where all of the previous structures find their authoritative climax. As the word of God the commands of Scripture are the commands of Christ, in Christ we meet God, the entire biblical narrative finds fulfillment in Jesus, and our identity as the people of God is defined in Christ. Wight explains how this works using the giving of the law. “The narrative expresses the indicative: Here is what has happened in your history, and these are the things that YHWH your God has done. Then the law expresses the responsive imperative: Now then, this is how you must behave in the light of such facts [in the light of reality].” Nowhere is there any hint of Wright setting aside the doctrine of Scripture; rather he upholds it and presents the reader with a robust theology of biblical authority in the process. So a missional hermeneutic must include at least this recognition—the multiplicity of perspectives and contexts from which and within which people read the biblical texts. Even when we affirm (as I certainly do) that the historical and salvation-historical context of biblical texts and their authors is of primary and objective importance in discerning their meaning and their significance, the plurality of perspectives from which readers read them is also a vital factor in the hermeneutical richness of the global church (39). Millar jests, “There you go if you can explain that to me I would be most delighted, come and tell me what it means after.” At this point a trend has emerged which causes this reviewer to seriously consider the spirit in which this critique is being given and casts suspicion and doubt upon the sincerity of Millar’s introduction pointing to their shared Northern Ireland origins and his fondness of Wright’s work. For anyone remotely familiar with missiology and contextualization Wright’s point in the quote above is quite clear. After Millar feigns confusion he states, “I think he’s saying that a missional hermeneutic sometimes makes sure that we don’t assume our culture is the only one who can read the Bible properly.” While that is an important thought Wright actually goes further to state that the global church benefits from the plurality of perspectives from which we approach the biblical text. The global church benefits from the gleanings of collectivist cultures and individualistic societies. It benefits from those who read from a power and weakness worldview as well as from those who read from an honor and shame worldview. Wright is arguing that as we approach the text from these different perspectives we are able to see how one individual’s culture affects their reading of the text, for better and for worse, and they are able to do the same for us. Therefore, the global church is better able to arrive at a culturally unbiased reading of the text as we interact with one another then we could arrive at when left on our own. Millar then makes another dismissive critique, “in fact at one point Chris argues that his missional hermeneutic, as he calls it, actually subsumes liberation theology, post modern readings, overcomes them all, but doesn’t become relativistic. Now, these are huge claims but they are not defended all that robustly.” Once more Millar offers no explanation of the weaknesses in Wright’s defense and paints no picture of what a more robust defense might look like. Wright’s thought here comes out as an implication of a missional hermeneutic. Because of “the multiplicity of perspectives and contexts from which and within which people read the biblical texts” the global church is able to learn from liberation and postmodern readings while recognizing and correcting the points at which their culture moves from illuminating the text to being imposed upon the text. Using postmodernity as an example he notes the importance of narrative within the postmodern mind and so we accept this correction but we do so while maintaining that the biblical narrative “is nevertheless actually the story” and all of our little stores make sense only within this larger story. So a missional hermeneutic allows for postmodernity’s correction of modernistic readings and allows the church to better balance truth as proposition (modernistic readings) and truth as metanarrative (postmodern readings). While Wright offers far more depth in his explanation that overview should be sufficient enough to demonstrate once more that Millar’s dismissive critique is without basis. Wright then explains that the Bible is both about mission and a product of mission. Millar agrees and notes that this is particularly obvious in the New Testament epistles. Then Millar explains how Wright introduces the third major conclusion of this text that “the Great Commandment is as important as the Great Commission in seeking to reach the world.” This comes as Wright explores the relationship between mission and authority which Millar explains as summarized best by Wrights statement, “A missional hermeneutic takes the indicative and the imperative of the biblical revelation with equal seriousness, and interprets each in the light of the other” (61). Wright then concludes the first section of his book by drawing a hermeneutical map where, “not only do the major features of the landscape stand out clearly but also other less well-trodden paths and less scenic scholarly tourist attractions turn out to have surprising and fruitful connections with the main panorama” (69). The main argument up to this point is that mission is God’s mission, mission is central to the whole Bible, the bible was written on mission, we need to read the Bible with a missional hermeneutic, and the whole Bible should shape our mission. John Piper, Let The Nations Be Glad! The Supremacy of God In Missions (Grand Rapids: Baker Academic, 2003), 36. Millar begins by giving a brief biography of his interactions with Christopher J. H. Wright and why this has led him to feel reluctant to critique The Mission of God. He then explains the three reasons why this book matters. Regarding the last point Millar explains, “Now please do not mishear me today. I am not saying that that’s Chris Wright’s intention that is simply not true.” We will return to this at a later point in the discussion of Millar’s critique. He then explains that Wright loves Jesus and is committed to the gospel and the Scriptures and because of this Millar approaches this with a sense of his own weakness and a prayer that whatever unhelpful things he says would be forgotten. I would add to Millar’s three reasons a fourth, namely the renewed interest in biblical theology in both the church and the academy. The number of biblical theologies written in the past decade is quite astounding and so this book arrives as a significant work for missiologists and theologians as well as pastors and their congregations. There have been books and journal articles in the past which have attempted to approach missions from a whole bible or biblical theological perspective but nothing on this scale nor anything providing such an in-depth analysis of the Old Testament on this subject, a point Wright makes very early on in this volume. The renewed interest in biblical theology as well as this volumes breadth, depth, and timely arrival have and will continue to garner a wide reading. Millar then moves to summarize what he believes to be the four key conclusions drawn by Wright in The Mission of God. He does so by reading several quotes from The Mission of God which I have included below. Fundamentally, our mission (if it is biblically informed and validated) means our committed participation as God’s people, at God’s invitation and command, in God’s own mission within the history of God’s world for the redemption of God’s creation (22). A different way of thinking about mission would be to imagine a whole circle of all the needs and opportunities that God calls (or sends) us to address in the world (317). Is the church, through the combined engagement of all its members, applying the redemptive power of the cross of Christ to all the effects of sin and evil in the surrounding lives, society and environment (322)? He then reads this quotation for a second time adding an interjection, “applying the redemptive power of the cross of Christ [‘whatever that means’] to all the effects of sin and evil.” This is one of the critical flaws in Millar’s argument that will be noted throughout this review. At this point he feigns ignorance and at others he will argue that Wright lacked clarity or ample explanation of his thought when this is clearly not the case. Any theology of mission that claims to be biblical must have at its core that which is at the very core of biblical faith – the cross of Christ. So if we are to establish that a truly biblical understanding of mission is holistic, integrating all the dimensions we have been surveying hitherto, then we must ask how all of that coheres around the cross (312). Only in the cross is there forgiveness, justification, and cleaning for guilty sinners. Only in the cross stands the defeat of evil powers. Only in the cross is there release from the fear of death and its ultimate destruction altogether. Only in the cross are even the most intractable of enemies reconciled. Only in the cross will we finally witness the healing of all creation (315). If the cross is the answer to all of these varying issues then how does the church go about “applying the redemptive power of the cross?” He answers this question using night blindness as an example. Night blindness is caused by a vitamin A deficiency, which is usually the result of malnutrition that can be traced to social injustice which has its roots in the human heart in the form of greed. Along this string of relationships and events the redemptive power of the cross is applied from the alleviation of present suffering, to the reconciliation of the oppressed to their oppressors, and the reconciliation of individuals to God. Beyond night blindness he returns to the exodus and reminds the reader of how redemption was applied in that context as God addressed a range of social and economic issues working towards the end that all peoples, but specifically Israel, know and worship Him. This is how Wright expects the church to apply the redemptive power of the cross by proclaiming and demonstrating how the cross radically confronts the powers of sin and evil and provides a future eschatological hope that has been inaugurated in the present. These concepts should not be lost on the reader nor should it be lost on a reviewer such as Millar. Conversely, a missional hermeneutic of the whole Bible will not become obsessed with only the great mission imperatives, such as the Great Commission, or be tempted to impose on them one assumed priority or another (e.g., evangelism or social justice or liberation or ecclesiastical order as the only “real” mission). Rather we will set those great imperatives within the context of their foundational indicatives, namely, all that the Bible affirms about God, creation, human life in its paradox of dignity and depravity, redemption in all its comprehensive glory, and the new creation in which God will dwell with his people (61). So although the exodus stands as a unique and unrepeatable event in the history of Old Testament Israel, it also stands as a paradigmatic and highly repeatable model for the way God wishes to act in the world, and ultimately will act for the whole of Creation. The exodus is a prime lens through which we see the biblical mission of God (275). There are certainly other conclusions that can be drawn from Wright’s work that are equally important as the ones pointed out by Millar. Central to the argument of this volume is Wright’s understanding of the relationship between the Old and New Testaments, between the indicative and the imperative. I will further explain this key conclusion later as it is clear that Millar does not understand the significance of this in Wright’s thinking.